International experienced engineers, energy professionals, architects and Construction professionals. Available in-house experienced and qualified professionals, integrated in coordinated teams highly trained for Design and Construction of Turnkey Projects. Specialists in all engineering disciplines, with profound knowledge of local and international standards and codes, capable of developing affordable and practical Technical Solutions to comply with Corporate and related Authority’s requirements. Team Leadership to coordinate with client requirements. Experience in retrofit and remodeling jobs while occupied and during revenue production cycles. Experience in construction management of small projects through jobs up to US $10M. Flexible working schedules – day, night and weekends. Very competitive purchasing costs for Technology related equipment. 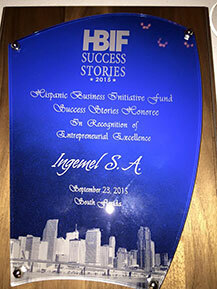 Ingemel honored with the 2015 HBIF Success Stories Luncheon of South Florida!